Tracey Shepos Cenami grew up in a family that was always cooking. Her Italian Nana and mother put considerable thought into everyday meals, treating each as a special occasion. She held her first job as a dishwasher at a summer camp and was immediately hooked on the comradery, artistic expression, and satisfaction of the kitchen. She knew she had found her calling. Throughout high school, she continued to pursue jobs in the culinary industry before attending the California Culinary Academy in San Francisco. After years in the culinary world, Tracey was drawn to the wine industry, which she found to be a natural transition. She loved the prospect of living in wine country and having the opportunity to create food to pair with specific wines. Before joining the Kendall-Jackson team, she worked for eight years as the executive chef for Stark Reality restaurants, a Sonoma County restaurant group. During her tenure there, she helped to open five different restaurants and create a catering department. 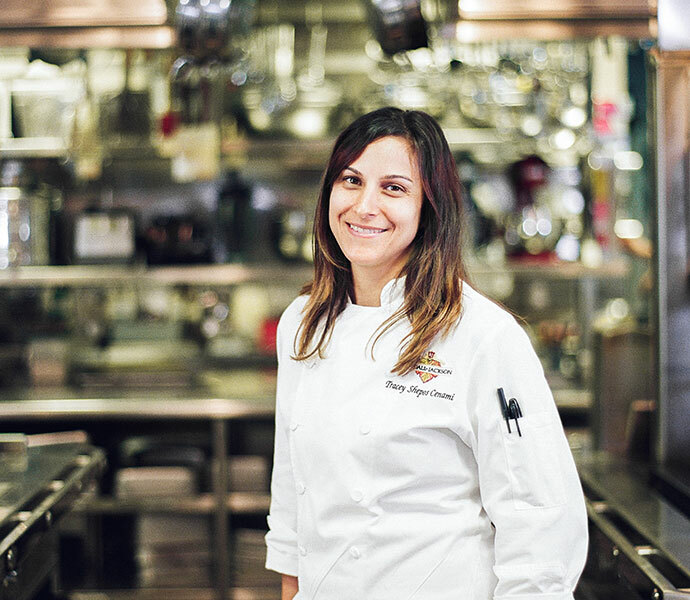 She also worked under Chef Michael Romano at Union Square Café for two years. Tracey considers the Kendall-Jackson Wine Estate & Gardens to be a chef’s dream. From the produce grown in the garden, to the selection of cheeses, to the beautiful kitchen, it offers everything a chef could want. Tracey is a vital member of the culinary team at Kendall-Jackson, specializing in wine country cuisine and artisanal cheeses. Her recipes have been published in magazines and newspapers, and she is a three-time winner of Food Network’s Guy’s Grocery Games. When Tracey is not creating perfect pairings, she enjoys spending time outside with her husband and son barbequing in the backyard or eating oysters on the Sonoma Coast. Her personal favorite pairing is Kendall-Jackson Vintner’s Reserve Pinot Noir with bacon almonds and Valley Ford Estero Gold cheese.